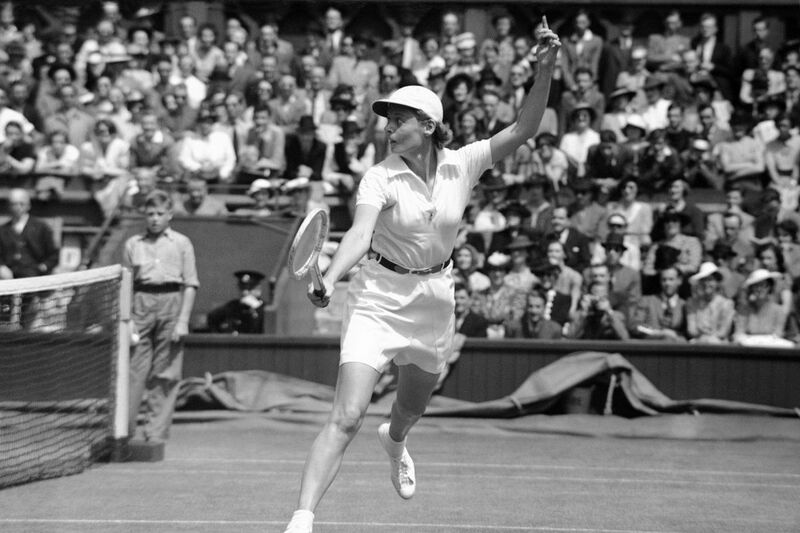 Alice Marble playing in Wimbledon in London on July 4, 1939. Researching a Pearl Harbor story last fall, I uncovered a newspaper photo of three smiling adults posing with a Bishop Hallahan majorette following a December 1941 defense rally at Convention Hall. Two were instantly recognizable – first lady Eleanor Roosevelt and John Kelly, the Philadelphian who won Olympic rowing gold, founded a successful brick business, and fathered Grace. But I had to check the caption to identify the third, an attractive woman in uniform. It was Alice Marble, a tennis star working then with Kelly in the newly created Office of Civilian Physical Training. Not much digging was necessary to discover that, despite their great fame, neither Kelly nor Roosevelt was the photo's most interesting historical figure. With the 2017 U.S. Open set for later this month in New York, and still no young U.S. superstar on the horizon, American tennis would kill for a character like Alice Marble. A powerfully athletic Wimbledon champion and the winner of four U.S. national championships, Marble had aggressive talent and movie-star looks that led the New York Times to describe her as "the golden-haired queen of tennis." Alice Marble, here in 1939, when she was the No. 1-ranked player in the world. A serve-and-volley pioneer in the women's game, she was America's top-ranked female player from 1936 through 1940 and was No. 1 in the world in 1939, when she won at both Wimbledon and Forest Hills and was the Associated Press' female athlete of the year. Overall, the native Californian captured 18 Grand Slam singles and doubles titles. "[She] was a picture of unrestrained athleticism," said Billie Jean King, "one of the greatest women to play the game." But, when she died at 77 in 1990, tennis was one of the least intriguing aspects of her obituary. Marble's life sounds fictitious, its highs and lows, its backdrops and accomplishments better-suited to some comic-book superhero. (Ironically, she worked briefly as a co-editor of the Wonder Woman series.) Her autobiography, Courting Danger, reads like a movie waiting to happen, which is why actresses such as Farrah Fawcett and Jessica Lange purchased its film rights. She was a talented baseball player before discovering tennis at 13, was raped by a stranger at 15, was confined to a sanitarium for a year with pleurisy, had an affair with a Swiss banker, was the first woman tennis player to wear shorts, designed clothing, was a groundbreaking female pro, appeared in movies, befriended such Hollywood stars as Clark Gable, lost her pilot husband in World War II, lost a baby in a car accident, spied for the United States during the war, was shot in the back while fleeing the Gestapo, failed at a suicide attempt, was a comic-book editor, successfully advocated for the inclusion of blacks in tennis, and coached a young California prodigy named Billie Jean Moffitt (later King). Born in a small mountain town and raised in San Francisco, Marble played seven sports at Polytechnic High. Her first love was baseball, and as a teenager she would sometime entertain San Francisco Seals crowds by playing catch in the bleachers. As a result, Seals outfielder Lefty O'Doul once asked her to shag fly balls with him. "Joe DiMaggio, beside me in center field, yelled encouragement," she remembered. "I kept expecting someone to tell me to leave." Tennis offered more possibilities for an athletic girl in the 1930s and Marble mastered the game quickly. By 18, she'd reached the singles and doubles finals at the 1931 U.S. Junior Nationals, held at the Germantown Cricket Club, winning the latter. The newspapers loved her California good looks – she was compared to Greta Garbo — and soon she was a favorite subject of sports photographers. Seeking to capitalize, Marble turned pro in 1941. Having no women competitors, she faced men in a series of popular exhibitions. Marble married in 1942, but her husband, Joe Crowley, was killed two years later when his plane was shot down over Germany. Weeks earlier she'd miscarried after a car crash. Depressed, she tried to kill herself with a handful of sleeping pills, only to be saved by concerned friends. Probably the strangest and most cinematic episode occurred in 1945, when U.S. Army Intelligence asked her to spy on her former lover, a Swiss banker who was providing financial services to Nazi officials. "When I agreed to use tennis as a cover for an assignment that had little chance of succeeding, I felt I had nothing left to lose but my life, and at the time I didn't care about living," Marble wrote. After she surreptitiously photographed documents in the man's basement vault, the Nazis uncovered her activities. She managed to escape in a classic car chase through the Alps, but not before a German bullet struck her in the back. Following the war, she turned to social activism. In a letter to U.S. tennis officials that appeared in the American Lawn Tennis Magazine, she urged the sport to end its prohibition against blacks and allow Althea Gibson to compete in the 1950 Open. "If tennis is a game for ladies and gentlemen," she wrote, "it's also time we acted more like gentle people and less like sanctimonious hypocrites." That year Gibson became the first black to play in the event. "She was my idol," Gibson would later say. "That letter accounted for my debut at Forest Hills." In 1984, 20 years after her election to the Lawn Tennis Hall of Fame, Marble was asked if, given such an astonishing resume, she had any regrets. "I did not get to see myself on television," she said, "and I did not get to play the tiebreaker." Everything else, Alice Marble had covered.